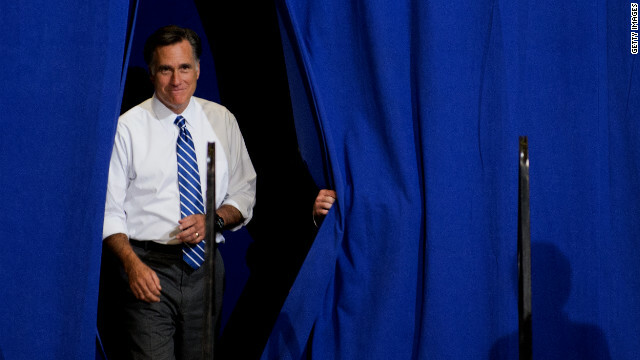 Romney entering an event in Asheville, North Carolina on October 11. Middleburg Heights, Ohio (CNN) - In a clear sign the campaign is confident about putting North Carolina back in the Republican column this year, Mitt Romney's campaign is moving its spokesman out of the state and plans to shift more staffers out in the coming days. The spokesman, Robert Reid, will be moved to Ohio, which is increasingly viewed by both campaigns as the central battleground of the 2012 race. "With the increasingly widening polls in North Carolina, we will continue to allocate resources, including key senior staff, to other states," said Romney spokeswoman Sarah Pompei. The campaign is not pulling out of the state completely. Pompei said their victory centers throughout North Carolina "will remain open and we expect our supporters and volunteers to remain engaged in our unprecedented get out the vote efforts through Election Day." The move confirms what Republicans have been saying privately for weeks: that North Carolina, a state President Obama won by just 14,000 votes in 2008, was trending safely in their direction, especially in the wake of Romney's impressive debate performance in Denver earlier this month. The staff change was first reported by the Raleigh News & Observer. Obama campaign spokesman Ben LaBolt responded to the news by posting to Twitter: "Interesting that the GOP is pulling out of NC the day early vote begins and Obama supporters are lined up around the block at the polls." Obama campaign traveling press secretary Jen Psaki said in North Carolina the Obama campaign has one of their best ground operations in the country. "We feel confident in our operation there and we're continuing to compete for every single vote," she said on CNN's "The Situation Room with Wolf Blitzer." Both campaigns poured more ad money into battleground states this week, including North Carolina. At $828,000, Romney's campaign spent less than Obama's campaign at $880,000. The ads run Monday through Sunday. - CNN Senior Producer Kevin Bohn contributed to this report. Dave- I just explained what caused the economic disaster but CNN censors won't allow it. Psst, it wasn't Republicans. Mitt Romney is a pathological liar and a sociopath the likes of which we have never seen before on a Presidential ticket. He makes Richard Nixon look like Mother Teresa. Make sure you tell Romney The Puppet Liar to not look back at NC! Hey – after 90 years of Billy Graham saying mormonism was a cult, the devil himself (rmoney) visited and billy has now changed his mind. That's what the devil is doing to ALL you christians. Lying and being a false prophet. Obama/Biden 2012 - because I don't like the devil. Texas Women for OBAMA 2012!! Any offers for a binder of Romney's 1040 forms – It is on sale at Bain and all the proceeds will be required to be paind into a Swiss bank account. That is racist but hey you cant spell either so I'm glad I have and education to show for it, and you still need 5th Grade spelling lessons. Romney's binders of women, don't worry about poor people, 47% Americans are victims, no women rights to choose, no equal pay for women, planned parenthood cuts, automatic guns support, tax cuts for the super rich, London Olympics Twit, and Benghazi/Libya, etc., comments & statements are unpresidential, unacceptable, and shameful. Americans, caveat emptor Romney/Ryan.